H E Y! D. O. M. I. N. O. 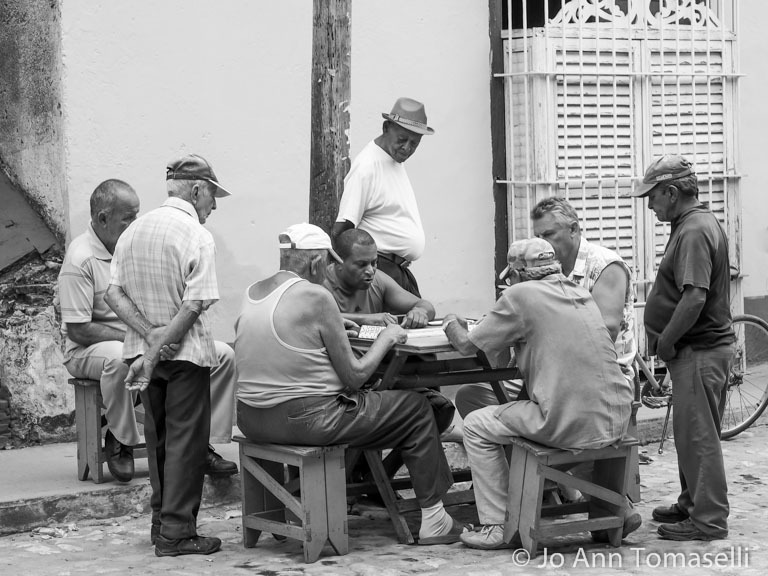 In Cuba, playing games is serious business and the game of dominoes is no exception! A favorite past-time for all ages, impromptu domino games are held out in the open air, in parks, in back-yards and best of all, smack dab in the middle of a the day on the edge of a busy street. The players, from my informal survey, are usually men of the retired age. The setting is an assortment of make-shift stools around old wooden tables. There’s not much talking as the strategy unfolds with each move and even the onlookers are relatively quiet in their observation and restrained in their opinions. Traditionally, a Sino-European domino set consists of 28 dominoes aka known as bones, cards, tiles, tickets, stones, or spinners. A domino set is a generic game, similar to a deck of playing cards or a set of dice, and a variety of games can be played with a set. Dominoes first appeared in Italy during the 18th century, and although it is unknown how Chinese dominoes developed into the modern game, it is speculated that Italian missionaries in China may have brought the game to Europe. As an age-old survivor in our modern technical world, there may be more to the game of dominoes than meets the eye; I believe I’ll give this ancient Chinese game another look! This entry was posted in Uncategorized and tagged art, bones, cards, China, Cuba, domino, domino game, dominoes, game, hobbies, image, Itlay, jo ann tomaselli fine art photography, leisure, male, man, men, old, photograph, picture, play, playing, senior, Sino-European, sitting, spinners, stones, table, tickets, tiles. Bookmark the permalink. What a wonderful moment to capture Jo Ann and a wonderful post. Love the insight. Sharing. You and your people….you capture humans spectacularly! ‘my people’ that makes me smile Sharon! Thanks so much for your high regard of my work ~ I really appreciate that!